Cross stitching is a cheap and easy way to make cute, homemade, Christmas presents for someone you care about. Fold your Aida fabric twice. First, you will fold it long ways in a 'hot dog' style. Then, you will fold it again to make a small square. Unfold your fabric and make sure you can see creases in it. When you first get new thread, it will come in one very long strand. Slide the loops of the thread on one edge of the scissors and cut it. Do this with all of your thread. If you buy a pattern, the center should already be found for you; however, free patterns may not be that convenient. Count all the squares across and then divide that sum by two. Do the same vertically. With your new numbers, you should be able to find the center of your pattern. Once you find it, draw a square around it. Note the chosen color of the starting place via the key on your pattern. For this pattern, the color is light pink. Your thread will have quite a thick few strands, so choose one of those strands. The strand you chose has a few smaller strands in it, but you only need two of them. Take the two strands and thread them through the eye of your sewing needle. If you are having trouble keeping the ends of the two strands together, you can either lick the ends or dip your fingers in water and pull them together. Be sure to pull the thread through the needle enough so that it won't be easy pulled out. The center of your fabric is found in the spot where all the creases that you made in your fabric meet. You will put your needle through the back of your fabric at the bottom the crease. You will continue to look at the front of the fabric while you do this. Be careful to not pull the thread all the way through the hole. For future reference, we will call this gap the starting area. Another small hole will be towards the right diagonal of the starting place. Pull your needle carefully through this gap, but don't pull the thread all the way through. Carefully pull the thread through the gap until the end farthest away from the needle is a little more than half of an inch from the back. Make sure you have enough thread in order to lay it across the other part of the thread. Carefully, put your needle through the gap right beside the starting place. Do not pull your needle all the way through. Instead, pull it until it is a little less than halfway through the gap. Flip your fabric to the back again. Take the loose end of the thread and gently lay it across the small space between the needle and the rest of the thread. Hold it there with a finger and grab the side of the fabric with the rest of your hand. Pull the needle all the way through now. Once you have found the left diagonal of your current position, pull the needle through the gap. You should get a small 'x' in the center of your fabric. Find the next row in your pattern to work on. You will begin just like you did when you did your first 'x'; however, you won't have to secure the thread now. Count how many squares is called for in the pattern. Then, start to pull your needle through lower left gap. Come back through your fabric at the gap right next to where you started the new row. It should share the same hole as your first square. Continue to do this four more times. Now that you have five right diagonal stitches, finish the row by coming back and making five left diagonal stitches. Continue to do this until you run out of the current strand of thread that you are using. Once you start to run out of thread to use and it becomes hard to keep the thread in the eye of the needle, you'll need to end the strand securely. To do this, you need to finish your current stitch. Then, flip the fabric to the back. Gently pick a few of the stitches with your needle and slide the needle. If possible, slide the needle through three or four stitches. Pull the needle all the way through and pull tightly. Next, grab your scissors and cut the end of the thread. Be careful not to cut the thread to short. When stitching a certain color, skip the places that another color will go. Do not stitch across the empty spots to reach another pink area. This will cause stitching the other color to be much more difficult. Start and secure your thread just like you did in steps six through ten. Then, follow your pattern and finish the purple on the lower right quarter. This quarter of the pattern only has three squares that are vertical. To finish this thread, simply pick the back of one stitch and pull your needle through. Then pick a different stitch and go through that one. The brown requires several stitches in a row. In order to be keep from stitching to the right too much and not being able to finish the row, simply count a small number of squares out and stitch those. Then go onto the next ones. With a long strand of thread, I was able to stitch ten stitches. As the thread grew smaller, I began to only stitch five squares at a time. Be careful and double check your counting when doing the leaves. They don't attach to another part of the pattern until the end of the leaf. Count the lower left gaps out from the part of the branch that they attach. Double check your counting. Do this for all five leaves. In order to complete the top right quarter of the pattern, count six gaps up from the work you have already completed. Be sure to double check yourself. Once you do this, you can continue working on your pattern as normal. Continue to count gaps upwards by six until you complete the pink stitches in the top right quarter. Using the same counting gaps upwards technique, count eight gaps. This will enable you to work downwards, which is much easier. Finish the purple part of pattern in this quarter. 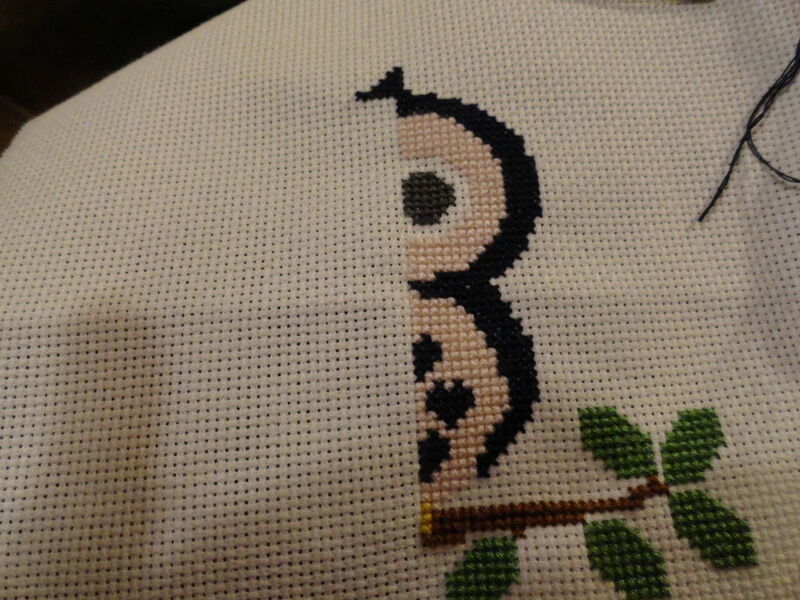 Count two gaps down from the pink, and stitch the dark grey eye. Continue the pattern and work down until you run out of thread. Once you do, thread your needle again and start on outlining the purple part that you will be doing. This makes it much easier to finish this side of the piece. To do this, simply count to the left five squares and continue to fill the outline. You can make the outline as thick or as thin as you want. I chose to make the outline thicker. Once you finish the outline, finish the purple squares. Stitch all the pink squares. Be careful to leave the correct amount of space for the eye and the beak. Remember, do not stitch across an area that you are leaving empty. Instead, go around it. Fill in the space left for the beak, and complete the left eye. Don't forget about the three squares on the right eye! Now that you have something to stitch off of, you don't have to outline to the purple. Finish the purple squares, and get ready to stitch the pink squares. Carefully, leave space for the hearts. Fill the hearts in with your purple thread. You can stitch across now because there is no other thread that will be stitched through this area. Stitch the feet first, then start on the branch. Outline the branch by counting towards the left five squares and then working towards the left. Once the branch reaches its end on the left, you can work on it normally and stop outlining it. White gets dirty very easily, so stitch the outer part of the eyes last. You will need to back stitch the veins on the leaves and the eyelashes. Take your needle and insert the needle in between the gap that is the lower left hole of the second green square on the leaf that is closest to the owl. Pull your needle through, but not all the way. Take your needle and insert it in the gap to the left of the hole you just pulled your needle through. Flip to the back of your fabric and secure your thread just like you would with a normal stitch. Pull the needle through the gap. Keep going back on the stitches you make until you make the veins and eyelashes. Be sure to use your initials and at least three back stitches. Now you have a beautiful, handmade present for someone! Cute owl and great instructions for people new to cross stitching. Great tips! I always start in the middle of a pattern but I didn't know this was an actual technique. Great job! Such a cute owl. btw, I'm a cross stitching fan!